I have spent some time reflecting on what the real meaning of Christmas is, and how it applies to my life. Our family celebrates the birth of our Savior Jesus Christ and what the gift of His coming really means for the whole world. Whether a person believes in Him or does not, Jesus still came to save us all. What He offers is a free gift of grace and love that knows no end. I would like to share my view of Him...this is just little Pixel Blue Eyes﻿ sharing my heart for a moment. 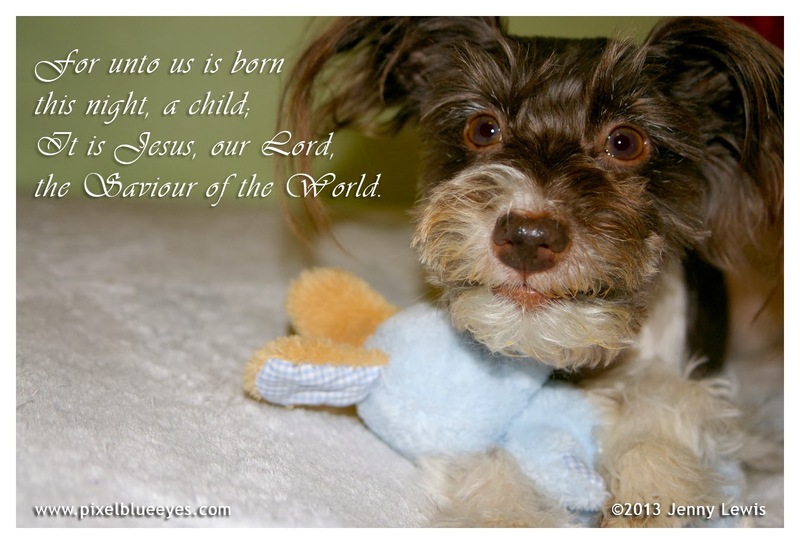 Jesus to the world is like an adopter/rescuer coming to an animal shelter. Think about it for a moment: a loving person comes to the shelter to save the unsavable, to rescue the unwanted, to give a new lease on life to those who have no hope, who are abandoned, lost, hurting, afraid, and trapped. The rescuer/adopter comes to the shelter, sees those in need of such love, and chooses to save the unwanted, unloved, and lost from certain death. That is exactly what Jesus is to the world. That is why we celebrate His birth, that is why this little dog knows that He loves me. I think it is a wonderful thing and I sure am grateful. Merry Christmas my dear friends! I hope you can feel the immense love I have in my heart for you. I hope you can sense His presence in your life. I hope that you feel hugged! I love you! God loves you! 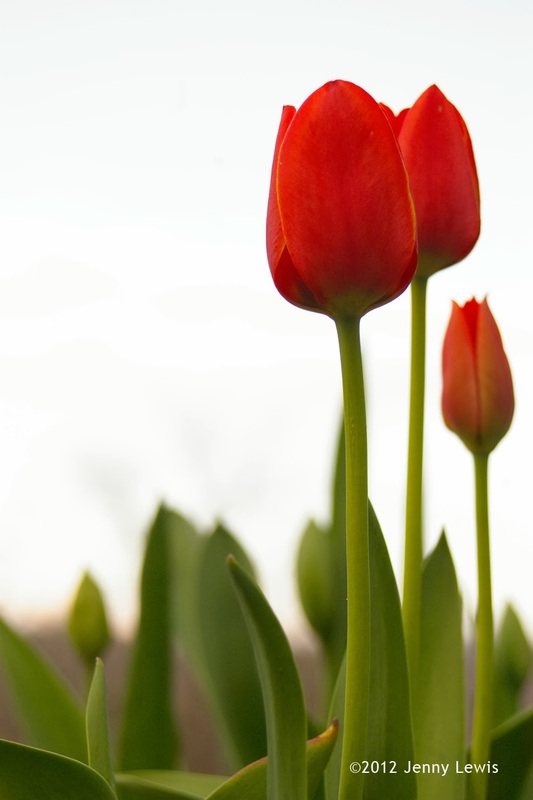 May this day be full of peace, love, laughter and smiles. As a professional pet blogger, I've made lots of fellow pet blogging friends over the years. 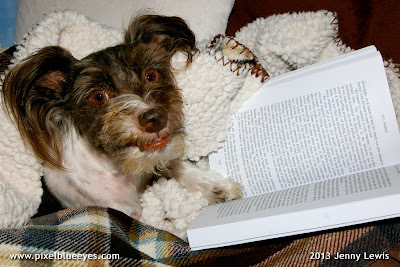 Believe it or not there are many other animals like me sharing their stories, lives, and adventures online, including dogs, cats, ferrets, turtles and horses. Who knew that us animals had so much to say? In celebration of the many pet blogs and their humans out there, and to challenge those behind the camera to come out and be recognized, several fellow bloggers have created a "Meet the Blogger" blog hop, to meet the humans behind the pet blogs. As with most writers, there is at least one person in their life who is a fantastic support. It makes all the difference in the world! 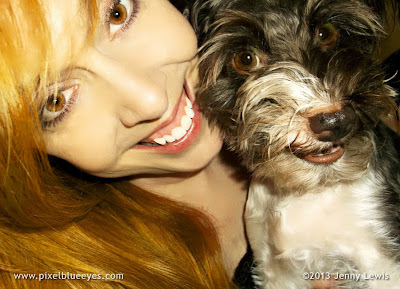 I'd like to introduce you to my Mommy (her name is Jenny) and share a little bit about her. First of all, we need to be clear that Mommy is 100% supportive of my blog and social media activities. My focus has always been to be absolutely kid friendly and full of fun, adventure, good information and sound advice. 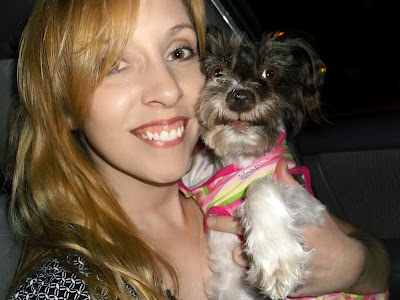 I must start by sharing that I adopted Mommy and saved her from heartache back in 2008. Of course she rescued me too. It was truly love at first sight! I had waited for her my whole life the day she walked in. I stared right into her eyes and deep into her soul. She knew in an instant that she was mine. She told me later she tried to give other pups a chance, but I was THE ONE. I knew that the whole time! Mommy and I originally started this blog back when I was 9 months old. She says that I brought her so much joy that she couldn't very well keep that all to herself, so with my blessing she started my blog. Oh how I chuckle at some of my first blog posts! But I've grown a lot since then and Mommy has helped me along the way. At first we only posted occasionally, sometimes only every few months. But it has really grown a great deal in the last couple of years and we wish we could do it full time! 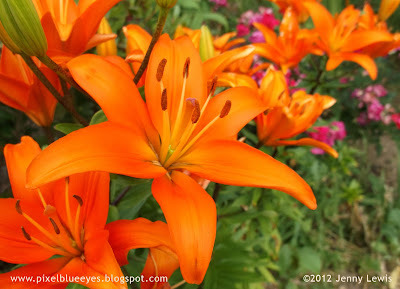 Our blog hop hosts have a list of questions for me to ask Mommy Jenny. 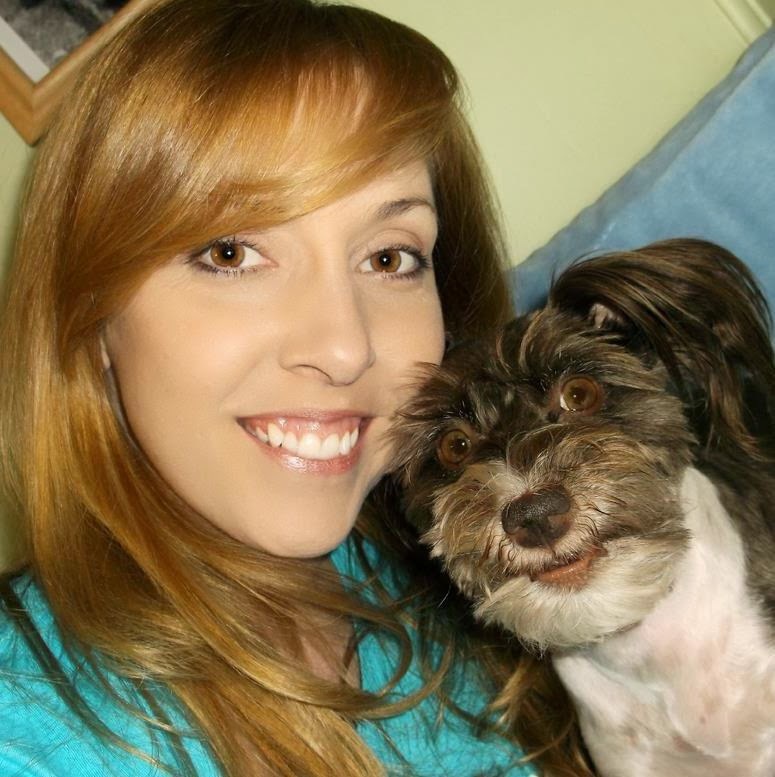 She agreed to do this interview with me since so many other blogger Mommies are doing it. 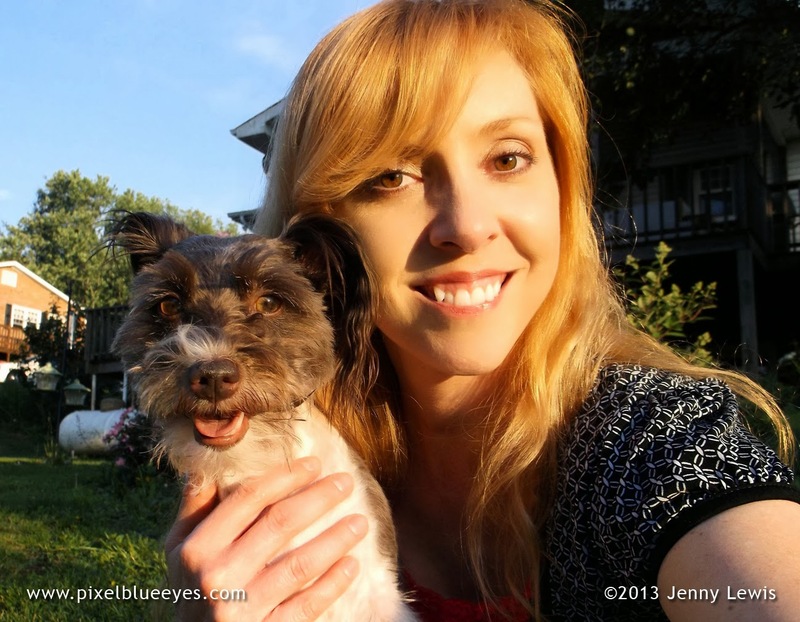 I hope you enjoy learning a little about the Mommy heart behind the Pixel Blue Eyes blog! 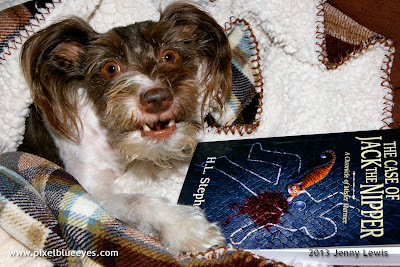 Pixel: What is one of your favorite non-animal related book? Mommy: Are you kidding me? I have to find one that doesn't have an animal in it? How fair is that? LOL! Okay, I will share one that doesn't have an animal in it as long as I can share one that does as well. Pixel: Okay Mommy, I will humor you and let you share both kinds of books. Mommy: I'd have to say that one of my favorite books NOT animal related is the Mary Stewart Arthurian/Merlin novels, written back in the early '70's, right around the time I was born. The first one is "The Crystal Cave" and I've read it a few times. I loved the series because she has the most realistic view of Merlin as a real person instead of some freaky evil sorcerer. Mary Stewart does a beautiful job of intertwining history and fantasy, and her attention to detail in her descriptions make me feel like I am right there. Mommy: Now, my favorite books WITH animals in it (you said I could include this Pixel) is the Chronicles of Mister Marmee series by H.L. Stephens. The first book is called "The Case of Jack the Nipper: A Chronicle of Mister Marmee" and the second one, which just came out, is "The Case of the Wayward Fae: A Chronicle of Mister Marmee". They are AMAZING adventures with Mister Marmee, who is a marmalade colored gentleman cat who lives in Victorian London and helps solve crime with the greatest detective ever, Sir Happy Heart. The two of them consult with Scotland Yard. The characters are so 3 dimensional, I feel like they are beloved old friends to me. You should know this Pixel, We've read these books together! Pixel: Okay, Mommy. Next question is: What is your favorite non-animal related movie? Mommy: Pixel, you're killing me! Okay, give me a minute to think... It is hard to pin down just one, because I love a variety of movies, so I will say the X-Men series and the movie "I-Robot" come to mind as ones I can watch more than once. One of my super favorites is "Avatar" but that has animals in it! To keep it well rounded though, I must include a comedy in here, so let's go with a silly favorite: Galaxy Quest! Pixel: Who is your favorite actor? Mommy: Well, I don't always know people's names, and most often I love actors that are excellent character actors. I might have seen them in a dozen things, but can never remember their name! Whomever was in the movies I mentioned, I like them! Pixel: What is your favorite holiday? Mommy: I love ALL the holidays, Pixel. But I really love Thanksgiving and Christmas because they are truly a time of celebrating togetherness with the family and eating amazing food. You know how much you love oven roasted chicken and sweet potatoes. Pixel: I know what you mean Mommy! I love getting to sit at the table with you and share a good meal. But we do that all the time, as well as on holidays. Pixel: Since we're talking food, what's your favorite meal? Mommy: Any meal I can share with you Pixel! Pixel: Awe Mommy, that is the sweetest thing ever! But you're not getting out of this question. Mommy: Okay, okay. One of my favorite meals is oven roasted turkey, homemade gluten free corn bread sausage stuffing, mashed sweet potatoes, gravy, and a wonderful dessert of either a huge piece of your Auntie's gluten free pumpkin pie or her amazingly decadent chocolate cake. I can't get enough! Pixel: What do you like to do in your free time? Jenny: That should be a given. Spend time with my little Pixel of course! I love being with you, whether we are playing, snuggling, writing or practicing your tricks. And I love having the two of us go out and run errands together, with you tucked securely in your harness carrier. 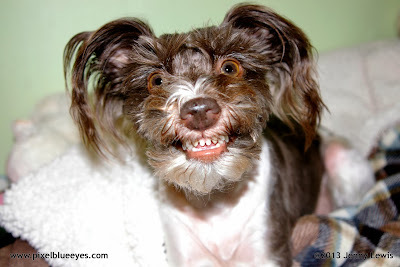 I've come to accept the fact that you do go crazy barking in every single parking lot we have ever entered. But you are my guard dog as well as my child, aren't you. Of course, I also love spending time with our family. We are blessed to get to see each other every day. We have such fun together don't we? Pixel: What do you wish you were more skilled at? Mommy: Sewing, playing the violin, juggling, and speaking sign language and Spanish...preferably all at the same time, LOL! Seriously, I can hand sew but need to take the time to learn sewing with a machine, I have a perfectly good violin but need lessons, I used to juggle but it's been years, and I know just enough sign language or Spanish to be an official interpreter (JUST KIDDING!). I would really like to get better at both languages, just because I like them. Pixel: What is one thing that you've done that you are most proud of? Mommy: Truly Pixel, I'd have to say that I am incredibly proud of your blog and the online presence we've built surrounding your sweet, adorable, funny, smiling self. I never could have imagined 6 years ago that we would have the kinds of friends and followers we have that love sharing your adventures and joys in life! It's been a great blessing and it has shown me that I am a writer. I never knew that about myself. I also have to say that I am very proud to have gone back to school in my 30's and earned 2 degrees, both of them involving computers and digital media. Before I went back to school I'd never thought of myself as very "academic" or interested in computers, but my wonderful family was very encouraging and supportive. They helped me see I could do anything I set my mind and heart to do. Now, I work AND play on computers all day. Pixel: Other than blogging, what are 4 things that you do that bring you joy? Mommy: Photography, being in the outdoors (even just standing in the yard is good for me), quilting by hand (though I haven't done it in a while) and volunteering my time and photography skills to our local shelter. I've been a photographer for almost 20 years now and I adore it! I started doing it well before the digital age, back when film was king. But I have moved completely over to digital and am amazed at how technology has advanced the photographic possibilities. I love nature and the beauty it holds. It just feels good to be out in it, whether it is sunny and 70F degrees or snowing and 20F. As for quilting, I have a lot of fabric I've collected over the years and several 'started quilt tops'. Unfortunately, I have yet to complete a full quilt project. Still, I enjoy the process of planning a quilt and choosing the design and material. Pixel: I can attest to the fact that Mommy has a lot of photos of the great outdoors, and lots of 'started' quilt tops. I am hoping to see one completed before I am a senior dog! BOL! Mommy: I will see what I can do to make that hope and dream a reality my silly little flower girl. Mommy: Regarding my photography and volunteering, one of the greatest joys for my heart is the volunteering I do at the Smyth County Animal Shelter taking pet portraits of all the animals who end up there, ones who are either lost or are looking for their new forever home. I make posters for each one and put them up on the shelter Facebook page that I co-admin with Officer Kristy Moore, a wonderful friend and animal control officer. She started the Facebook page not too long before I called out of the blue to volunteer my services. In the last 2 years we've helped hundreds of dogs and cats find new, loving forever homes, or be reunited with their families after getting lost. 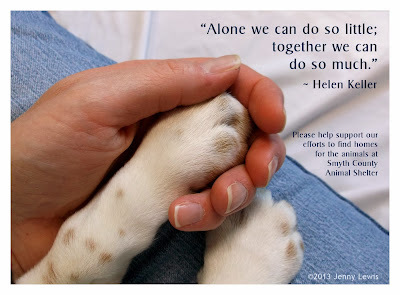 We started with just a few hundred followers, and one rescue helping us. We've grown to a whole network of wonderful rescues and volunteers who help us save lives everyday, and the shelter Facebook page is closing in on 3,000 followers! It's a legacy that has forever changed me. 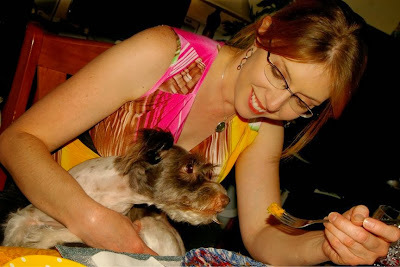 Pixel: And I love sharing the dogs and cats and happy endings on my page and here on the blog. Which, by the way, we need to do another 'happy endings celebration' post on the blog! Pixel: Alright Mommy, I have one more question to ask, and this one I made up. What are 5 things people might not know about you? Mommy: Hmmm, I think I can come up with a few things for this one. 1. I love snow and snowflakes. I love things with pretty snowflakes on them, and I even try to photograph snowflakes and snow crystals in winter when we get good snowfalls. 2. I love silly socks! I wear them under my work clothes and boots. Hello Kitty, unicorns, you name it, and I will wear it. 3. I worked in radio, TV, did night club deejay work and was a stage hand for concerts when I was a teen and into my early 20's. It was a great experience and I got to meet and work with some really fantastic artists. 4. I used to not like cats very much, but one day a very sweet cat changed my heart, and now I LOVE them! 5. I love box turtles and tortoises! Years ago I had a few and I loved their personalities. If I had a huge piece of land, I'd have a pet rescue sanctuary and turtles would have their own section to roam free in. 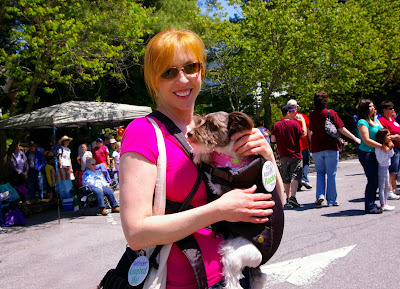 Pixel: Thank you Mommy for letting me interview you for this special "Meet the Blogger" blog hop! Mommy: It was my pleasure Pixel. Thank you too! Now, let's go read about all the other bloggers. 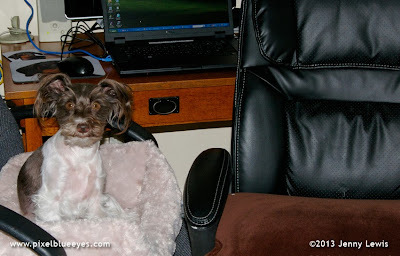 The links below are a doorway into many other fantastic pet bloggers that are wonderful and a real joy to read. I hope you enjoyed this special interview. 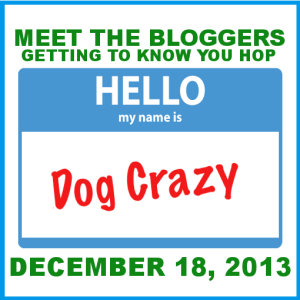 Have fun getting to know about other pet bloggers. I love my toys a whole lot! They are like my children in a way. I care for them, love them, play with them, and make sure they get a good night sleep. Some of them are quite mischievous though! You tell me, is Bumble Snowman wanting to tell me a secret? Or is he about to nibble on my ear? Leave a comment and let me know! Happy Wordless Wednesday a day late friends! Welcome to the "Pixel's Joy of Giving" Ideal Balance Treat Giveaway Award Show!! 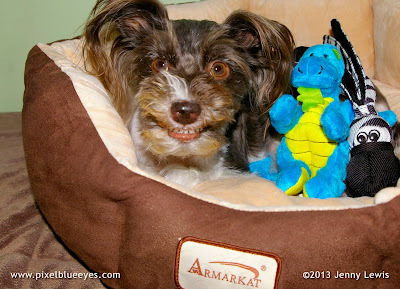 This is the 2nd Pixel Gift Giveaway sponsored by my friends at Hill's Pet Food. I can't wait to share the exciting results and name the recipients. Their names are listed here in this "secret ballot" envelope. 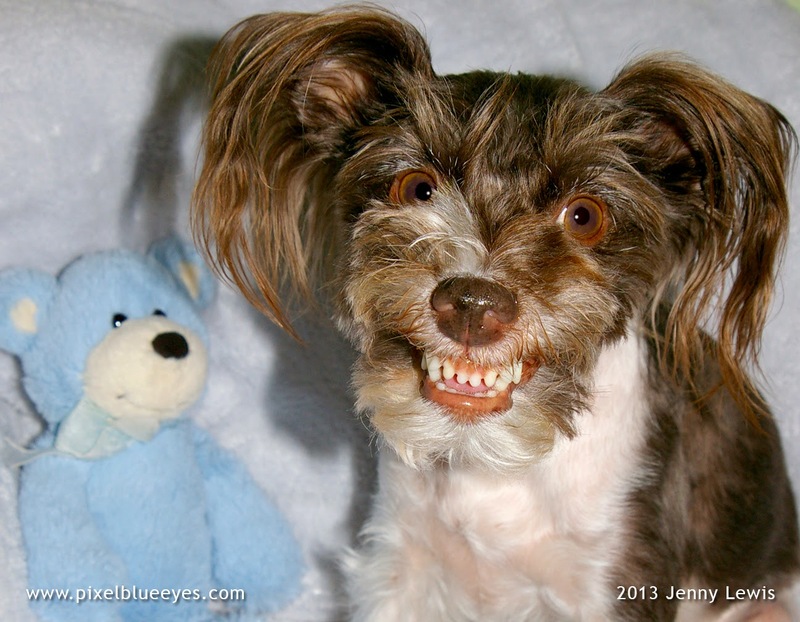 I've enlisted the help of my friend "Little Blue Bear" to help me call out all the winner's names. No one has seen who the winners are, not even me. I had the names specially drawn by an independent panel. But before we name the winners, let me give you a little background on the giveaway. 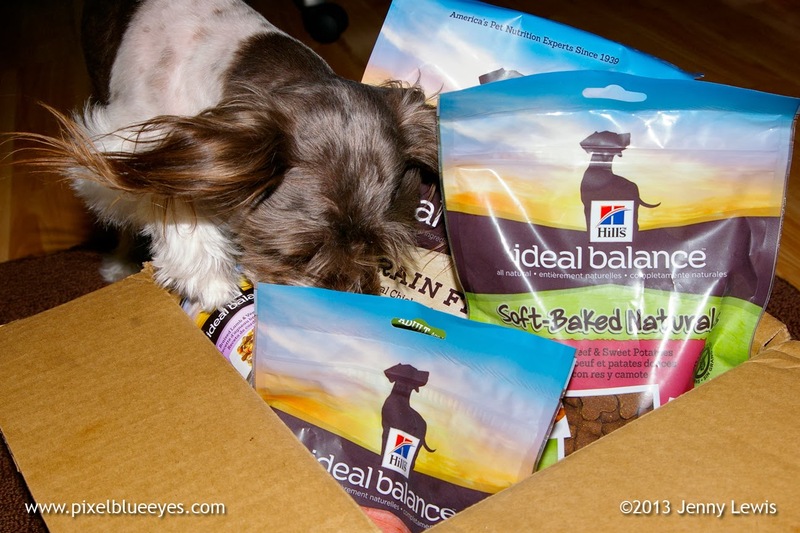 I teamed up with my friends at Hill's pet food to introduce their wonderful line of Ideal Balance pet food and treats. 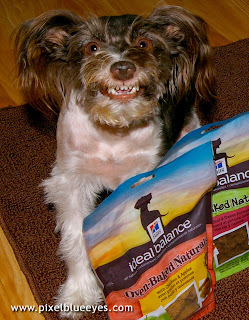 As part of the campaign, we had this giveaway so folks could try the Ideal Balance all natural dog and cat treats. This giveaway started during the month of November and included the Thanksgiving holiday. As part of the fun of entering, I had everyone share messages of gratitude for the blessings in their life. There were all kinds of wonderful responses on Facebook, Twitter and here on the blog. The original blog post for this exciting giveaway can be read here. I received many wonderful comments about what everyone was thankful for, most notably the joys of family, animals, good health and the joy of laughter. It was so invigorating to see so many grateful sentiments! Each one of the 20 lucky winners will receive 3 bags of either Hill's Ideal Balance dog treats or cat treats. Hill's has several varieties of dog treats and one kind of cat treat that are sure to please your little ones! Don't be surprised if some of the winning dogs or cats do what I did and jump right into the box of delivered goodies without a warning. And yes, this wonderful giveaway will be delivered right to your door. What a great way to celebrate the holidays by giving gifts! I know that the anticipation to name the lucky recipients is growing in leaps and bounds right now, so without further ado, let's announce the winners, shall we? IF YOU ARE A WINNER, YOU MUST CONTACT ME ASAP TO CLAIM YOUR PRIZE AND GIVE SHIPPING INFORMATION TO MOMMY JENNY LEWIS! Please email me at: pixelblueeyes.blog at gmail dot com, private message me on Facebook or direct message me on Twitter. I need your name, physical address with city state and zip code, phone number, email address and pets names. 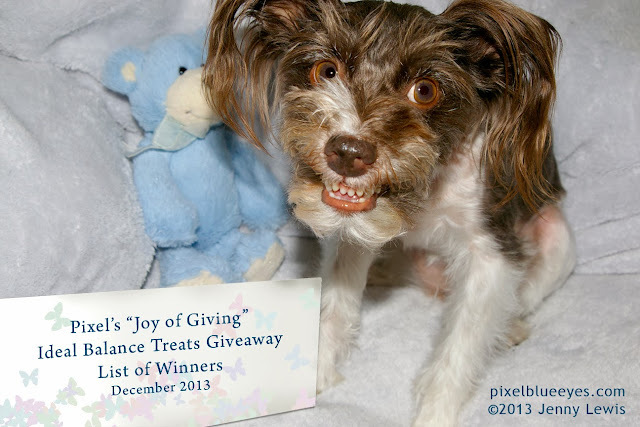 Congratulations to each of the lucky winners of the "Pixel's Joy of Giving Treat Giveaway" sponsored by Hill's Ideal Balance pet food. I hope you enjoy them and I can't wait to see photos! Photos of our past winners from my other Hill's Ideal Balance giveaway will be posted soon here on the blog. Thank you for participating friends and have a wonderful week!! Happy Cyber Monday friends! I know, I know, that sounds a bit strange coming from a little dog like me, but I am a social media doggie, so I must keep up with the times. 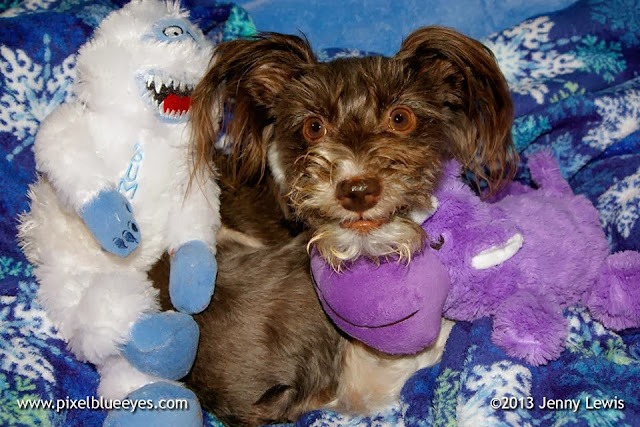 Since Hannukah is upon us and Christmas is just around the corner (not to mention December Birthdays and "Gotcha Days" for all my anipal friends), I am teaming up with Pet360.com, a fantastic resource for all pet parents, to promote a special offer they are having TODAY ONLY. Pet360 is giving away a free canvas tote bag to every single person who places an order on their online store. So for every purchase that is made, even if you only get one thing, you get a free tote! It's a nice one too. Mommy uses them to carry my stuff around when we go out and about. She also uses them to carry the stuff she gets at craft fairs, Christmas bazaars and farmer's markets. They are quite versatile! So my friends, to get this free tote, all you have to do is select the Pet360 button link above or in the top right corner of my blog here, and start shopping! They have so many cool things, Mommy loves the site! She just told me earlier that she got me something for Christmas from there, but doggone it, she won't tell me what it is. Guess I will have to wait until Christmas morning to find out...don't worry, I'm a very patient little girl!